Jay Rice’s practice generally concerns the defense of insurance companies and their insureds in a wide variety of civil litigation matters. Mr. Rice’s practice is primarily devoted to litigation involving insurance coverage disputes. 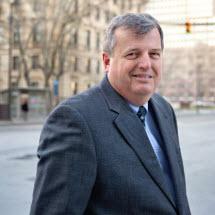 He is an OSBA Certified Specialist in Insurance Coverage Law. Mr. Rice also has extensive experience in appellate practice in both the Ohio and Federal Court systems. He has argued cases in almost every Ohio Appellate District and has had twelve cases before the Supreme Court of Ohio. Mr. Rice enjoys an AV Preeminent rating with Martindale-Hubbell.